Find hotel near Panchi Villa Ayurveda Cen ..
History says, Bentota has been the center of Ayurveda for years. 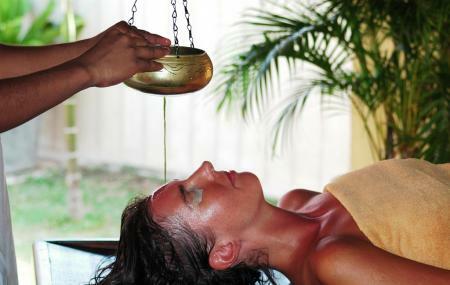 Hence, if you are visiting Bentota, you cannot give a miss to an ayurvedic treatment. And the place to get the best service for it is Panchi Villa Ayurveda Center. Nestled right in the heart of the coastal town, this ayurveda center is located within Panchi Villa. Surrounded with luxurious villas for accommodation, this center promises to provide the best ayurvedic treatment with serene beauty to compliment it. Their experienced doctors and specialized therapists assure you to provide the best service. Drop in here and pamper yourself with the best traditional massages! Free Wi-Fi connection is available throughout the villa. Duration of the session ranges from 20 minutes to 2 hours. Kindly check the official website. Love this? Explore the entire list of places to visit in Bentota before you plan your trip. Fancy a good night's sleep after a tiring day? Check out where to stay in Bentota and book an accommodation of your choice. How popular is Panchi Villa Ayurveda Center? People normally club together Spa At Saman Villas and Bentota Ayurveda Centre while planning their visit to Panchi Villa Ayurveda Center.